Hello hello hello! How can we make life easier at this busy time of year as we begin our end of year wrap-up? Well, let’s talk a little this week about some Google Tips and Tricks! For instance, did you know you can turn any piece of a YouTube video into a GIF simply by putting the word GIF in front of the address?! How about moving the icons in your Google Waffle for ease of use? Sometimes it’s the little things! I learn these tips and tricks through friends, Twitter, and conferences. With so much tech out there, I feel like I am ALWAYS learning something new! Take a look at a few new tricks I’ve learned below! This is something so easy, yet so useful! You can move the icons in your Google Waffle to any order you would like. DOn’t use Hangouts? 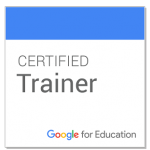 Move it to the bottom and move Classroom or YouTube to the top! See the video below for help! This little tip is also so easy, yet so useful. You can “move” or organize your Docs/Slides/Sheets right at the top of the item. Take a look at the video below – this may assist you with organization. There’s a GREAT extension that can turn your phone into a remote for your Google Slides! It’s called Remote for Slides and you can see how it works here! A handy little tool! Here are a few great extras from Google that I really liked playing with this week. I read about them here on Matt Miller’s blog. Really neat for Science, take a look at the timelapse of an area on Earth. It’s really neat! This is REALLY fun! Give it a try! Google gives you something to draw, and you have a limited time to draw it. Great for a brain break! 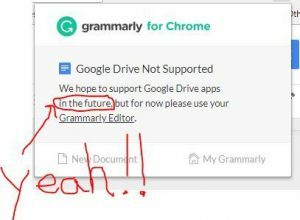 Grammarly is coming to Google Docs (FINALLY)! It’s in BETA right now and hopefully will release soon! I hope these tips and tricks find you well! Reach out anytime you need a quick tip or easy workaround, I’m here ☺️! ← Updates Updates! Let “minnow” how I can help! Just letting you know we included this post in this week’s Edublogs newsletter. I wasn’t sure if you are on Twitter so we can tag you?